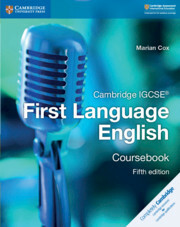 This Cambridge IGCSE First Language English series written by experienced examiner Marian Cox, has been updated in line with the revised syllabus (2018). 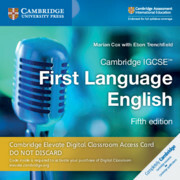 It provides improved navigation across all three components and a choice of pathways which enable teachers and learners to tailor the course according to their particular needs. The coursebook follows a modular, spiral curriculum whereby skills are revisited more than once allowing students to progress with confidence. 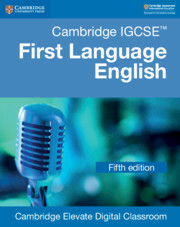 The book's structure ensures that every individual is supported throughout and is encouraged to achieve their full potential. This is a skills based resource enabling students to develop life skills beyond the exam. It follows a communicative, active-learning approach where speaking and listening are integrated throughout. 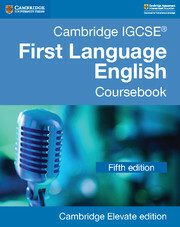 There are also additional optional units devoted to speaking and listening. The resource includes a wide variety of international text types, in line with the revised syllabus, and clearly organised scaffolded writing sequences.